After snoozing my trusty bedside clock for three consecutive times this morning, I said thank you to Jesus for a perfect Sunday past and a revitalizing stretch of sleep. It was a quiet Monday morning where the gentle purr of the furnace was as clear to my ears as the heaving exhales of some slumbering giant, and I might have believed, for the briefest moment, that I had the house to myself. As I sucked on the cold orange slice between my teeth, I gave myself the luxury of imagining the chill of its juice soothing the shriveled tissues in my throat. It was well past magic hour, and the sunlight was crawling up my left arm and slowly up my profile. These fleeting moments are usually the most dangerous. And today was no exception. A newly instated holiday borne out of the most innocent of intentions, the words “family day” sank heavier than iridium into what is now a crater in my thought. Immediately fragments of the most plain and puerile experiences flooded my mind, and as they darted into the away, I felt as if I had plummeted a thousand feet back into the seat of my chair. I wanted an old stale book with yellowing pages to curl up in, for the notes of Das Wohltemperierte Klavier to be hammered into my brain, for the sun to burn away the nerves in the surface of my skin. Then my throat tightened, so I sucked on another slice of orange. So apparently when I get emotional I don’t consume food…I produce it, and often that’s when I come up with the better half of my kitchen endeavours. And this dish is full of psychotic pinks that will stain not just your fingers should you touch it, but also your precious white Club Monaco shirt should you dare to wear it to dinner. 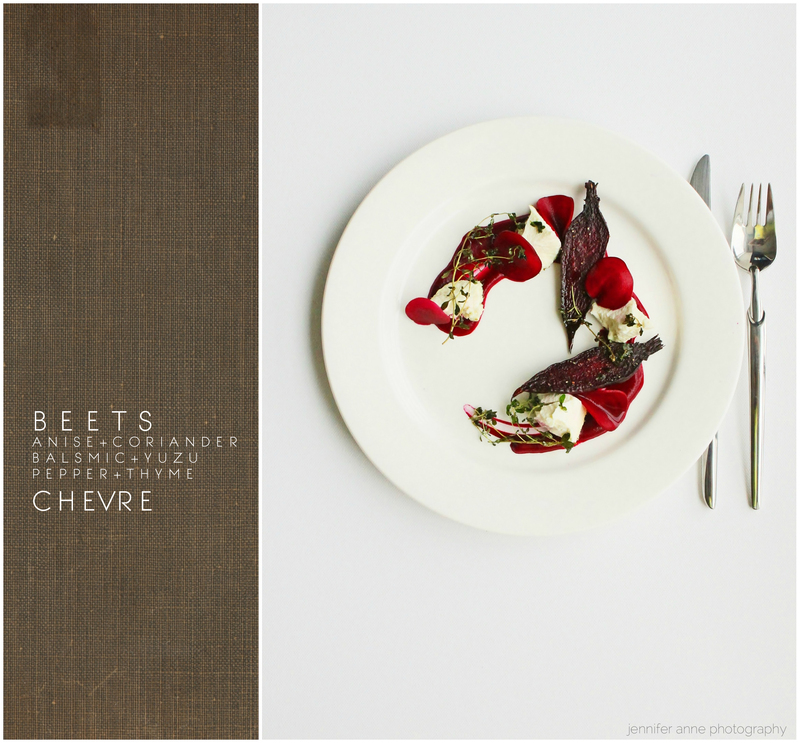 Beets, that’s right, in my three favourite variations of it: butter-basted with fried thyme for meatiness, candied and pureed with yuzu and EVOO for richness, and pickled with anise and coriander for crunch and tartness. If you remember Heart Beets from way back, this one would definitely be an upgrade as it pays more respect to the natural beauty of this revered root. And of course, you’ll see chevre at the party too. To make the pickled beetroot, place the sugar and vinegar in a small pot and bring to the boil. Pour the mixture into a clean glass jar and add the coriander and anise. Bring it down to room temperature, cover, and chill overnight in the fridge. On the next day, add the sliced beets and refrigerate (covered), for at least 3 days or up to a week. To make the candied beetroot puree, place all the ingredients in a high speed blender and puree until completely smooth. Add a splash of water to help out the blades if need be. Push the mixture through a fine-meshed sieve and chill, covered, until ready to use. To make the butter-basted beetroot, melt the butter over moderately high heat in a cast iron pan. Add the thyme sprigs and stir until fragrant and push to the side. Place the beets, cut side down, firmly in the pan and sear until crisp and caramelized while you baste the top side with butter. Flip and let the other side take some color as well. baste and season generously with the thyme-infused butter. Paint a near-circle of beetroot puree with the back of a spoon on 3 or 6 plates. Place a few chunks of broken cheese on the puree and position the butter-basted beet as pleases your eye. Add a few pickled beetroot slices here and there to fill the desolate spaces and garnish with the fried thyme. Finish with more salt and pepper and a drizzle of walnut or hazelnut oil if you’re really feelin’ it and into shiny food. No, really, go for it. Enjoy, all you lovely human beings! Strengths: Years of exp in food and food style; love to learn new culinary cultures; knife skills. Weaknesses: Quiet at office; Asian culinary knowledge is below average. Haha, good sense of humour!